Agape is the Greek word for ‘love’. Specifically, it means the self-giving kind of love – as opposed to romantic love, brotherly love, etc. 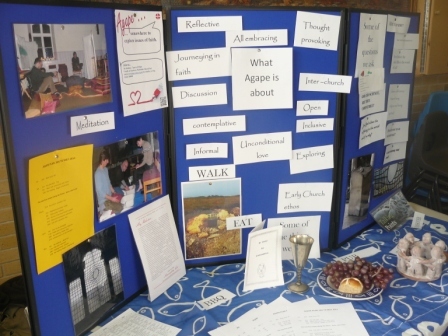 In the ‘Agape‘ group we seek to show ‘agape’ love to one another by listening to each other’s concerns, by studying the Bible together, by praying, and by sharing a monthly meal of a Eucharistic kind. Anyone is welcome to join us, either occasionally or regularly. We usually meet at 7.00pm on Sunday evenings at Shaldon Road Methodist Church. Sometimes the venue is different, so it’s best to check before you come. Contact details as at the top of the page. We are a diverse group of people from very different faith backgrounds, but we have come to appreciate that we all have something to learn from one another. We would love you to come and share this kind of exploration of faith with us and see whether it’s for you. 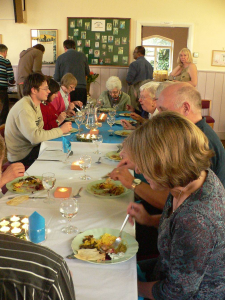 Not all meetings are held at Shaldon Road, we also go on picnics, walks, or visit local pubs, but would always have a question on the table of a topic to discuss. Agape is for anyone, so all are welcome − come and find out if it is for you!